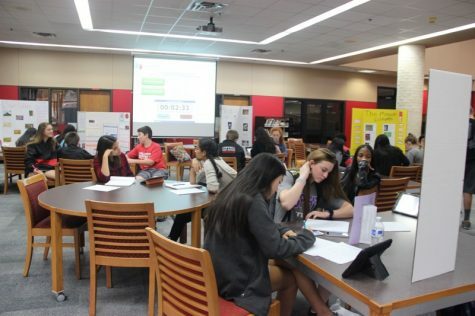 During third period on Tuesday, Coppell High School freshman Vico Moya and his group follow along with a slideshow over the Mayan culture in CHS coach Nick Benton’s third period Geography class. Students worked on poster boards about the Mayan culture before thanksgiving break, and presented their projects to their classmates. 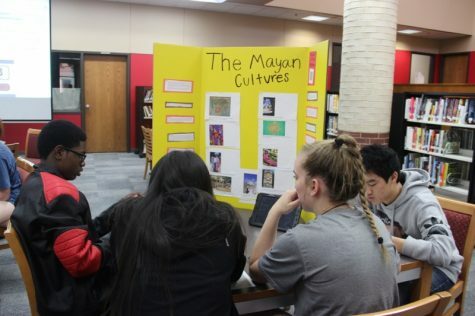 During Coppell High School teacher and coach Nick Benton’s third period World Geography class on Tuesday, students learn about the Mayan culture. 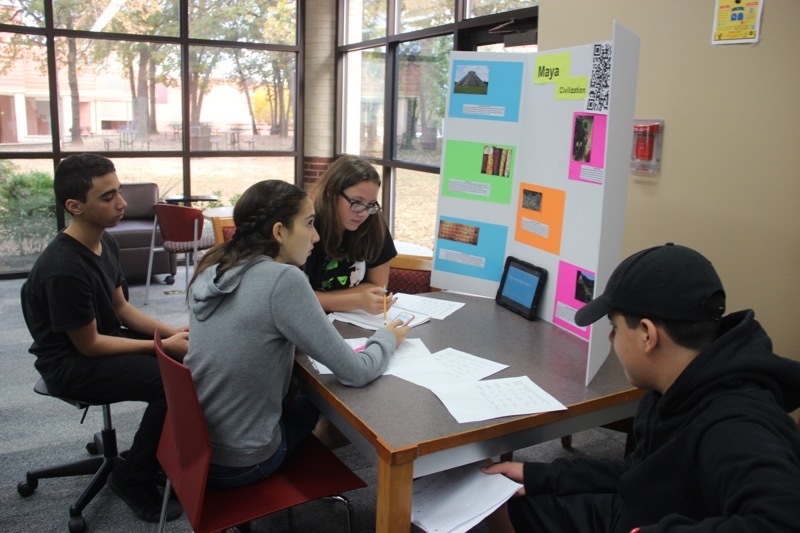 Students moved around the library to see different presentations and wrote down the many different things they learned from their peers. 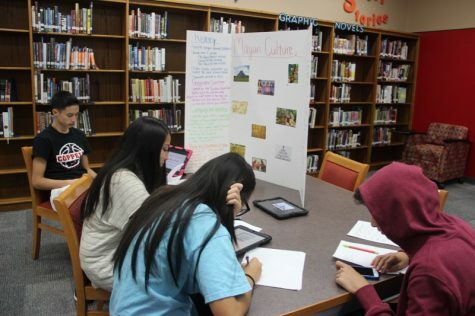 During third period on Tuesday, Coppell High School freshman Riley Orhearn and her group listen to music from the Mayan culture and observe the rest of the project in the CHS library. Students wrote down their personal feedback on each presentation for their World Geography class. 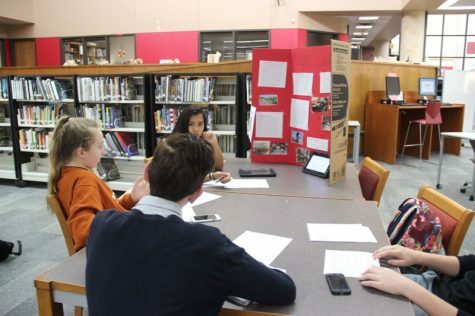 During Coppell High School teacher and coach Coach Nick Benton’s third period World Geography class on Tuesday, CHS freshmen Patrick Parker and his group discuss another group’s presentation. 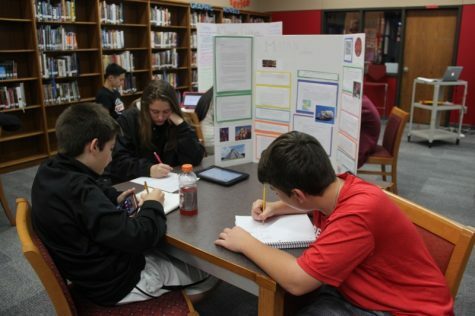 Students worked on poster boards before thanksgiving break, and presented their projects to their classmates. 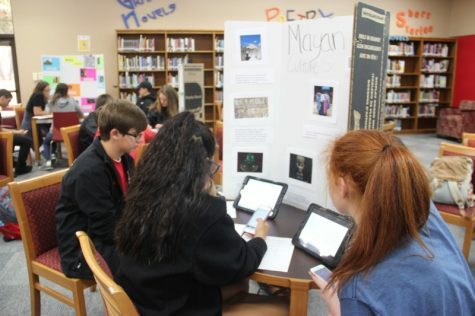 During Coppell High School teacher and coach Coach Nick Benton’s third period World Geography class on Tuesday, students are following along with a slideshow regarding the Mayan culture that students have been learning for a few weeks. During third period in Coach Nick Benton’s World Geography class on Tuesday, students observe the different colorful pictures of the Mayan culture. 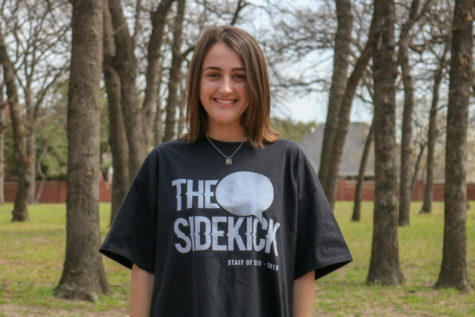 Students were expected to write feedback for every presentation given by their classmates. 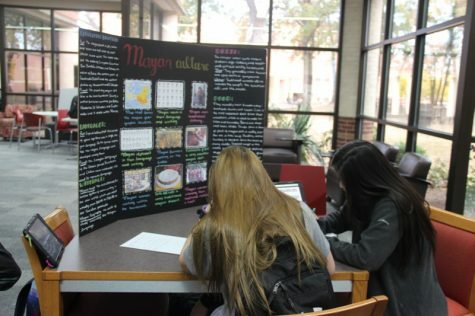 During third period on Tuesday, Coppell High School freshman Michael Hudson observes a poster regarding the Mayan culture and writes down feedback for his group. Students were allowed to move around the library to observe the other students’ presentations.